BACHOT -Ambrosius Bachotus Parisiensis Inventor. BACHOT,A. - Ambrosius Bachotus Parisiensis Inventor. Ambrosius Bachotus Parisiensis Inventor. - BACHOT,A. Title : Ambrosius Bachotus Parisiensis Inventor.. Size : 8.5 x 6.5 inches. / 21.7 x 16.5 cm. Description :Early copper engraving by Amboise Bachot. 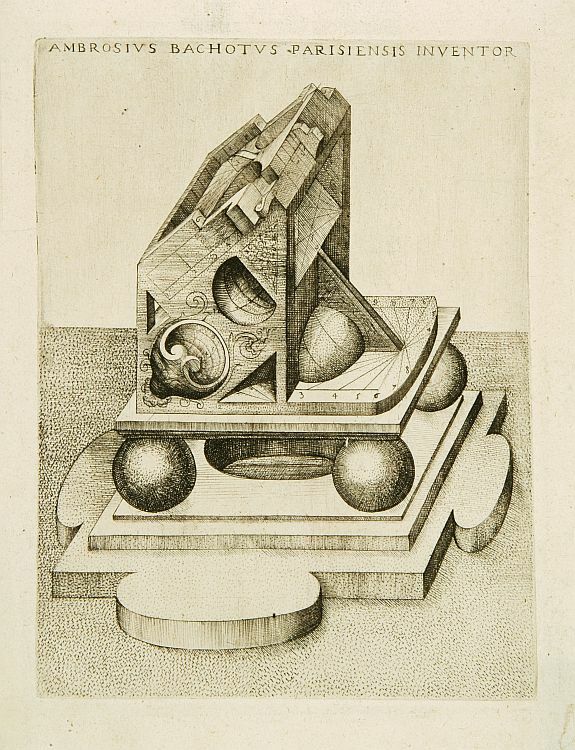 He was the author of Le gouvernail lequel conduira le curieux de geometrie en perspective dedans l'architecture des fortifications (1598), which has never been studied in the secondary literature.